Houston janitor Adriana Vasquez travels to Congress and asks Jamie Dimon one simple question. 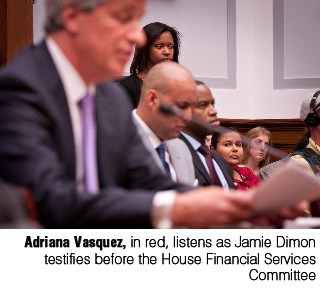 On Tuesday, Adriana Vasquez sat to the left of the table where JPMorgan Chase Chief Executive Officer Jamie Dimon testified before the House Financial Services Committee for two hours. A 37-year-old janitor and a single mother of three, she had traveled from her home in Houston to Washington, DC, to ask Dimon one simple question. When the hearing adjourned, she crossed to talk to him. Vasquez is accustomed to speaking to executives at the JPMorgan Chase Tower where she works, so she wasn’t intimidated. But she says she “felt strange” as she approached the table. Vasquez says Dimon’s entourage reacted “as if I had a weapon on me,” quickly surrounding him. “Call my office,” Dimon replied, before being ushered toward the exit. Vasquez had wanted to add “walk a day in my shoes,” but didn’t get a chance. That’s exactly what Vasquez and over 3,000 of her colleagues in Houston are asking building owners and cleaning contractors to do as they consider the janitor’s demand for a raise to $10 an hour over the next three years. The janitors are currently paid an hourly wage of $8.35 and earn an average of $8,684 annually, despite cleaning the offices of some of the largest and most powerful corporations in the world—Chevron, ExxonMobil, Wells Fargo, Shell, JPMorgan Chase and others in the “City of Millionaires.” The cleaning contractors have countered with an offer of a $0.50 pay raise phased in over five years. Vasquez says she doesn’t think people realize just how hard their work is. She cleans twenty-four bathrooms on eleven floors, from 5:30 to 11:30 pm, five evenings a week. She describes the work this way: before clocking in, she makes sure her cart is stocked with chemicals and supplies. After clocking in, she literally runs up to the floor if the tenants aren’t around. Vasquez says one floor receives “detail work” every night. There are a number of women over age 60 who work as janitors in her building. She worries about them, especially the ones who vacuum and clean the offices as Vasquez did before she was assigned to clean bathrooms. Vazquez says that some of the janitors develop a rapport with the people whose offices they have cleaned for years. Occasionally, the employees will give janitors a gift or a gratuity. But even that’s getting more difficult now. But with the janitors now asking for a wage that would help them and their families escape poverty, tenants and building owners have a chance to do far more than offer a kind Christmas gift—which brings us back to Dimon and JPMorgan Chase. The company is the third-largest building owner among all the owners that the 3,200 SEIU janitors clean for in Houston. The fact is that the cleaning contractors are going to do whatever the owners tell them to do, so in short—What Will Jamie Do? Tuesday was an even worse day than usual to be poor in America. Why? Because an amendment to the Farm Bill that would have reversed a $4.5 billion cut over ten years to the food stamp program (SNAP) was overwhelmingly defeated. That’s a cut that the Congressional Budget Office (CBO) says will reduce benefits by $90 per month for an estimated 500,000 households. Since the average SNAP household receives $284 per month ($4.46 per person, per day), the proposed cut is deep and significant. (Click on the graphic at right, courtesy of Share Our Strength’s No Kid Hungry Campaign, for more on the importance of SNAP). The importance of food stamps as an anti-poverty measure can’t be overstated. The program lifted 3.9 million Americans above the poverty line in 2010, including 1.7 million children and 280,000 seniors. The average beneficiary household has an income of only 57 percent of the federal poverty line (about $9,900 for a family of three), and 84 percent of all benefits go to households with a child, senior or disabled person. What about the novel idea of fighting for what you believe in and then compromising, if necessary? A determined Democratic Party could have let the American people know the many ways that $4.5 billion over ten years could be paid for, including: eliminating $4.1 billion per year in special tax breaks for the oil and gas industry; or—here’s a really easy way—$4.6 billion would be generated over ten years if there weren’t special rules that permit owners of corporate jets to avoid paying taxes on these expensive toys; or, how about cutting back on the $110 billion in subsidies the oil, gas and coal industries will receive over the next ten years? The final Senate farm bill that passed wasn’t all bad news. As the Food Research and Action Center noted in an e-mail, the Senate rejected “amendments that would have crippled the program and left poorer, hungrier, and unhealthier millions of people who rely on the program for basic food”; most notably, an amendment that would have block-granted SNAP, Paul Ryan–style. That’s probably due in no small measure to the organizing and activism of countless citizens and anti-hunger advocates. Next up is the House Farm Bill, and considering that the House-passed Ryan Budget cuts $133 billion over ten years from SNAP, expect it to be a lot worse. It’s important that people stay engaged and keep fighting hard for people who are hungry—especially because too many Democrats aren’t. I’ll tell you who has Congressman Paul Ryan’s number—the nuns on the bus. Do you know these Soul Sisters? If you don’t, start following them. From June 18 to July 2, NETWORK—a national social justice lobby led by Catholic Sisters—is going on a nine-state, twenty-eight-city bus tour to call attention to the House Republican–passed Ryan budget and the damaging effects it would have on poor, vulnerable, and struggling people throughout America. They are also meeting with Congressional offices to advocate for a fair budget. The tour began in Des Moines, Iowa; stopped at Representative Ryan’s office in his hometown of Janesville, Wisconsin; was in Chicago yesterday to meet with the Sun Times editorial board and visit Mercy Housing, which provides affordable housing for families, seniors and people with special needs; and now is heading onto Indiana, Michigan, Ohio, Pennsylvania, Maryland, Virginia, and Washington, DC. In Des Moines, Sister Simone Campbell—a Roman Catholic nun and the executive director of Network—took issue with Representative Ryan’s assertion that “his Catholic social teaching” informed his budget proposal. I’ll continue to provide updates about this tour. You can also stay informed via Bill Moyers. “Guilty until Proven Innocent: Sanctions, Agency Error and Financial Punishment within NY State’s Welfare System,” Federation of Protestant Welfare Agencies. This report shows the Herculean task that New Yorkers face in connecting with and maintaining welfare assistance. The state’s poorest residents face an obstacle course of program requirements that are exceedingly difficult to fulfill and often results in the loss of welfare assistance through arbitrary case sanctions. As of March 2012, three in ten people participating in work requirements were sanctioned or in the sanction process. The city has a dismal record of defending its actions—the agency is found lacking in over 75 percent of state-administered fairness hearings. Even when a family receives a full welfare grant, it is still living in “deep poverty”—below half the poverty line (less than about $8600 annually for a family of three). A case sanction results in the monthly cash income for a family of three being cut from $753 to $502. “Sanctions come at a great cost to struggling households, and city and state budgets alike, since sanctions lead to a need for emergency shelters when housing is lost; domestic violence survivors are stuck in shelters or are forced to return to their abusers due to lack of resources; and parents come under the scrutiny of the child welfare agency because they lack essential income to meet their children’s needs,” said Liz Accles, senior policy analyst at the Federation of Protestant Welfare Agencies.